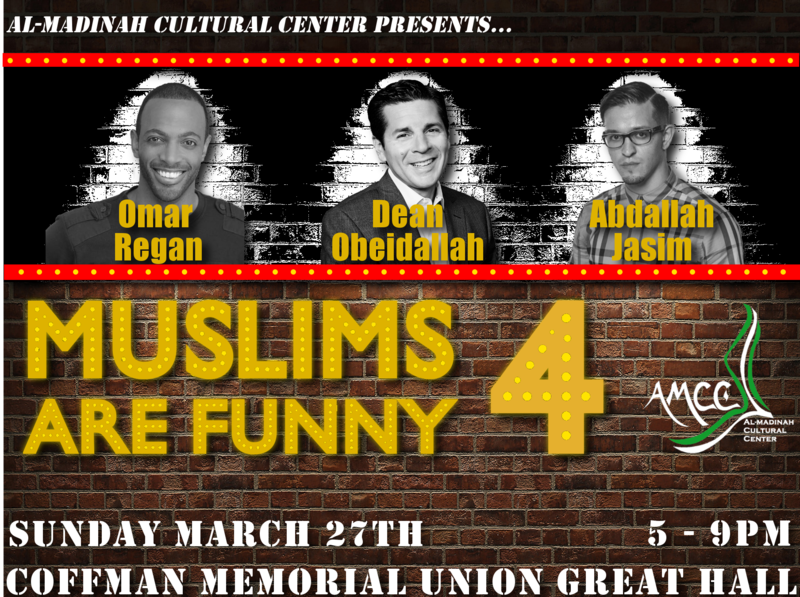 Muslims are Funny 4 is TOMORROW! Our annual Comedy Night is finally happening tomorrow evening! Use #MAF4 on social media to share your excitement with us! The event begins at 5PM, but we will open doors starting at 4:30PM in the Great Hall of Coffman Memorial Union at the University of Minnesota-Twin Cities. We are expecting a very large audience so, it is best to get there as early as possible. Tickets will be sold for non-University audience for $5/person at the door. University students with ID will not be charged for admission. We will be serving food as part of the program during the night. For more information visit https://amccumn.com/events/comedy-night/.